The loudest rallying cries from Colorado teachers protesting for more education dollars were about dwindling paychecks that are steadily losing ground to the state’s rising cost of living. Teachers usually say a persistent funding shortage, which has cost public schools $6.6 billion since 2009, led them to walk off the job and close down schools last week. Among the biggest reasons for lagging pay is one of the least understood: The rising cost of state pensions. Colorado isn’t the only state where an underfunded retirement system has played a role in a teacher uprising sweeping the U.S. In Kentucky, educators in at least 20 school districts walked out of their classrooms after the GOP-led Legislature in March passed a measure reducing retirement benefits for future teachers. Elsewhere, pay and other benefits, such as health care, have been at the forefront of teachers’ demands, including in Arizona, where a historic statewide strike has closed down schools for four days. But that doesn’t mean rising pension costs are not a factor behind the scenes. Public pension systems nationwide face record levels of debt, totaling $1.4 trillion, according to a recent Pew Charitable Trusts study. That puts downward pressure on wages and benefit checks as governments struggle to close the funding gap. It suggests the recent outcry over teacher pay could spread in coming years, whether pension costs are widely acknowledged as a driving factor or not. In Colorado, school district payments to the public pension fund have roughly doubled since 2006, to 20 percent of payroll. That has squeezed budgets when the state also was cutting funding during the recession. In that time, average teacher salaries have grown 21 percent, to $53,768, according to salary data from the National Education Association. But inflation in the greater Denver area has outpaced it, the Bureau of Labor Statistics said, leaving teachers with an 8 percentage point drop in buying power. Since the recession, Colorado school districts have shed staff, frozen pay and cut programming to make ends meet. Some have shifted to four-day weeks. Pension costs have played a role in the financial woes at Cheyenne Mountain School District in Colorado Springs, Superintendent Walt Cooper said. Since 2009, the district has shuttered an elementary school and frozen pay twice. Other years, it could only offer minimal raises that fell short of inflation, he said. For Colorado teachers, the pension’s role in school funding struggles adds insult to injury. Additional contributions are not padding the benefits of current teachers. The bulk of the money that school districts spend on the Public Employees’ Retirement Association is paying off $32 billion in benefits previously promised to public-sector retirees but never properly funded. Meanwhile, teachers are being asked to work longer hours at lower pay than their predecessors. Current teachers indirectly paying for their predecessors’ retirement is not unique to Colorado. A 2016 study by Bellwether Education Partners found that $14 of every $20 that school districts contribute to the pension of each educator nationally are paying off unfunded debts, with just $6 going to the worker’s retirement. The disparity is about twice as stark in Colorado. Just $3 of every $20 spent per teacher goes to their retirement, according to an analysis by the retirement system. The costs of those debts are likely to get worse. Colorado’s pension is among the worst funded in the U.S., and lawmakers are considering several solutions to shore it up. Democrats and Republicans disagree on what taxpayers should contribute and the extent that employees should pay in. But both sides agree on cutting retirement benefits more deeply. A Colorado teacher making about $70,000 who retired in 2016 after 30 years of service receives an annual pension of about $56,000, according to the fund’s financial reports. But the average pension benefit in 2016 was far less — about $37,000 a year for the typical retiree who worked until 58. Cutting future benefits worries teachers. Public sector workers in Colorado don’t receive Social Security checks, so proposed cuts to cost-of-living raises would leave them more vulnerable to inflation. Its members don’t contribute to Social Security, which was created after the state fund. “We don’t have another option. 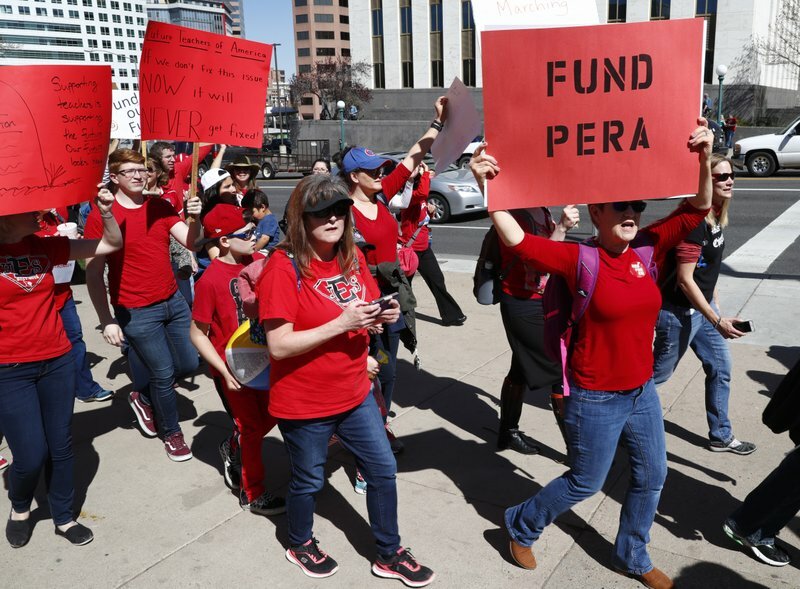 So what happens to PERA affects us for the rest of our lives,” said Suzanne Ethredge, president of the Pueblo Education Association, whose members recently voted to authorize a strike following three straight years of difficult contract talks. This story has been corrected to show that Suzanne Ethredge’s last name was misspelled.